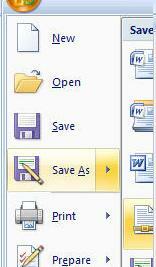 On the main screen of Word, there are two areas which show all the functions this program offers to its users. The first area is the Office Button, which encompasses actions such as creating a document, opening an existing document, saving, printing, and others. When you click on this button, a menu will open. It will show you the main functions. We can access them by placing the cursor over them and clicking the right button on your mouse or by pressing Enter. As you can see, there are 8 main tabs (sometimes called "ribbons") on this tool bar: Home, Insert, Page Layout, References, Mailings, Review, view, and sometimes Add-Ins depending on your version of the program. If, for example, we wanted to use the options for Page Layout, we would need to place the cursor over this tab, click on it, and it would show us the functions it has. In the upper right-hand corner, we can see three very important buttons we need to be able to recognize and know how they work. Minimize button, it is used to reduce the screen to its minimum without actually closing the application. Restore button, it is used to return the screen to its original state. IT is regularly used after we have minimized the screen and we need to see the screen once again. Close button, it is used to close the document or the application.